If you’re sitting down to tackle making an album, there’s a lot to think about; from clearing the rights for your cover songs to converting the cover art to the right format. These issues can trip you up, or cause the album to take a lot longer than you’d expect. Randy Chertkow and Jason Feehan, authors of The Indie Band Survival Guide, have revised our popular Planning Your Album From Beginning To End guide. Here’s an excerpt from the revised guide, which you can download for free right now! The following material has filled many books, so rather than go into detail about how or why you’ll want to do all the steps below, we’ll simply list them out so you don’t forget to do them as part of your music publicity campaign. This should be your overall strategy for the album and any live shows you do in support of it. Most bands do both a traditional media campaign (newspapers, magazines, and radio), as well as a new media campaign (podcasts, music blogs, MP3s, entertainment blogs). Music publicity is not just compiling lists and following steps mechanically. It can and should be fun and creative too. It’s at the planning stage that you should be channeling the same creativity you put into your music to build excitement and buzz about your upcoming album. What’s the biggest music search engine in the world? YouTube. In fact, video is possibly the only true viral media on the web. Beyond being an amazingly powerful medium for generating awareness and sales of your music, it also can be monetized and generate revenue for you. These are the documents that you’ll either send out (to the press, bloggers, music reviewers, etc.) or need updated online if they have questions or need more information. Updating these now will save you time and energy later when you start sending these out or people start asking you for them. Plus, by crafting the message, tone, and language for your release and promotion here, you can repurpose the content as you update your website and web presences. Sending a press release is a simple way you can notify the media of your album and CD release show. They’re not that difficult to write and there are free press wires that will help you blast out your release to the media. If you find a website, blog, radio station, or podcast that looks like it may play your music but lacks details about submitting, reach out to the blogger, podcaster, or website owner directly. Always obey the rules of submission. Don’t miss out on coverage by making their life more difficult. It’s people, not technology, who make things happen. Your fan network is no exception. Don’t be afraid to involve them and ask for their help. Keep your fan network up to date about the upcoming album and give them exclusive cuts from the album as a reward and to whet their appetites. Involve your fan network early in your music publicity efforts so you can create missions and steer their enthusiasm from random acts of buzz to a coordinated effort that’s in line with your overall strategy. Don’t rely on just a social network (e.g. Facebook) as your website. Platforms like Facebook are important for promotional purposes, but these are your “web presences.” Every musician needs a home base – a site that you control, with your own domain, where you’re not competing against advertising. If you’re looking for a place to build and host your own website with your own domain, check out HostBaby, a web hosting service for created for musicians. HostBaby features include 10GB of space, hundreds of design templates to choose from, an email newsletter tool, gig calendar, streaming audio, video, guestbook, and blog/news page tools. You also get unlimited email addresses @yourdomain. Often overlooked, writing from your own band’s domain name is a simple, consistent, and effective branding and promotional practice. Once you update your music resume documents, you’re ready to update your website to announce and feature your new album. This should include blogging about the upcoming release, but also could include adding songs and videos on your site to generate interest. Update your web presences with news about your upcoming album (Facebook, Twitter, Eventful, etc.). Remind fans about your mailing list and blog so they can stay informed as to when the album drops. Add the “radio single” to your web presence audio players. Nothing justifies a new newsletter or email campaign like announcing your upcoming album and shows and following up with promotion and press being generated. 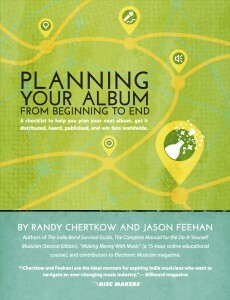 Billboard magazine called Randy Chertkow and Jason Feehan “the ideal mentors for aspiring indie musicians who want to navigate an ever-changing music industry.” They’ve written three books with major publishers (Macmillan, Random House), teach music business (including a 15-hour online course called “Making Money with Music”), and are regular contributors to Electronic Musician magazine.